Make It a Rockin’ Fathers Day on Oahu! Is your Dad a rock star? You bet he is! Fathers Day concerts on Oahu are a rockin’ way to honor your Dad this year, and we’ve highlighted three big ones taking place this Sunday. Read-on to learn more about each, and don’t forget to make your reservations soon! Is your Dad an Elvis fan? How about Michael Jackson? Celine Dion? If so, it’s time to let him rock-out with some of his favorite music while enjoying gourmet food, premium beverages, and the Waikiki backdrop. At the Rock-A-Hula’s Fathers Day Musical Celebration, Dad can have it ALL, courtesy of the largest Hawaiian show in Waikiki. The show features Hawaiian and Polynesian entertainment such as hula and fire-knife dancing, along with superstar performances by Elvis Presley, Michael Jackson and Celine Dion tribute artists. Dad will also receive a King’s Scarf to commemorate the night, and the whole family will be able to meet the cast after the show. The Terrace Luau Buffet and Show package features a delicious whole roasted luau pig buffet dinner and an E Komo Mai Tai for $109 per adult and $66 for children 3-11. The Stageside VIP Dinner and Show package includes a luxurious 4-course Maine lobster, tenderloin steak and salmon dinner at a private table and super premium beverages for $149 per adult and $89 per child. To treat dad to the ultimate “celebrity” experience, opt for the Green Room Dinner and Show package with exclusive “champagne” reception and backstage tour, extravagant 4-course dinner, super premium beverages and a souvenir photo for $185 per adult and $111 per child. Make sure you ask about kamaaina and military pricing. All packages are complete with premium beverages and an exciting post-show Meet-and-Greet with the cast. Dinners begin from 6:00 p.m. and the show kicks off at 8:00 p.m. For more information or to make a reservation, call (808) 629-SHOW (7469) or visit www.RockAHulaHawaii.com. 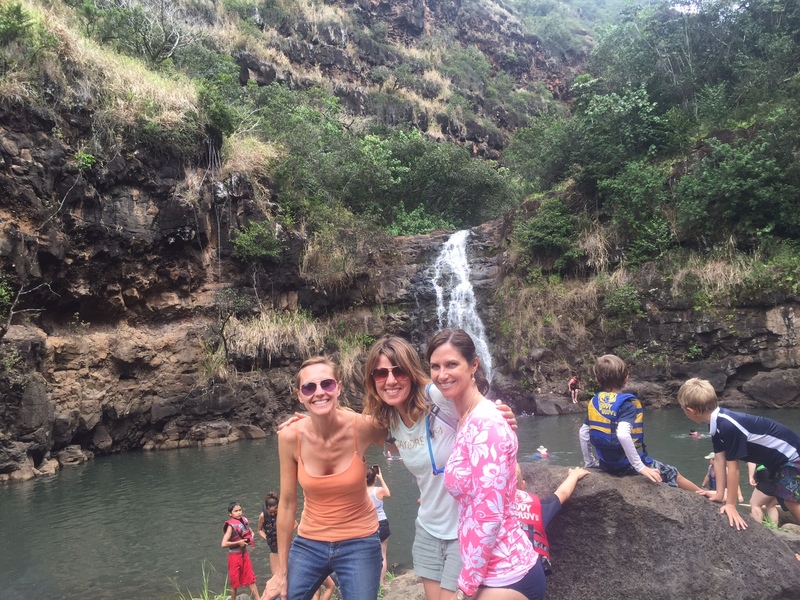 The author and friends at Waimea Valley, one of our favorite places on Oahu. When you book a Fathers Day buffet and concert at Waimea Valley, your ticket comes with admisson to Waimea Valley, where you can hike to Waimea Falls. And if Dad wants to burn some pre-show calories while in Waikiki, you can always treat him to a surf and stand-up paddleboard lesson or another ocean activity. Book through Hawaii Aloha Travel and save your money for tickets to the show! The event costs $47 per person, but check for kamaaina discounts (gratuity not included). Call 808.777.4890 for tickets. Food service starts at 11 am, and live entertainment starts at 1 pm. Purchase tickets by clicking here. If you’re looking for a local, tropical, lush Fathers Day, look no further than Waimea Valley on Oahu’s north shore. There, you’ll find yourself dozens of miles away from the hustle and bustle of Waikiki — and a million miles away from a care in the world! Kumu Hula Tracie and Keawe Lopes and Ka La Onohi Mai o Hae Hae. 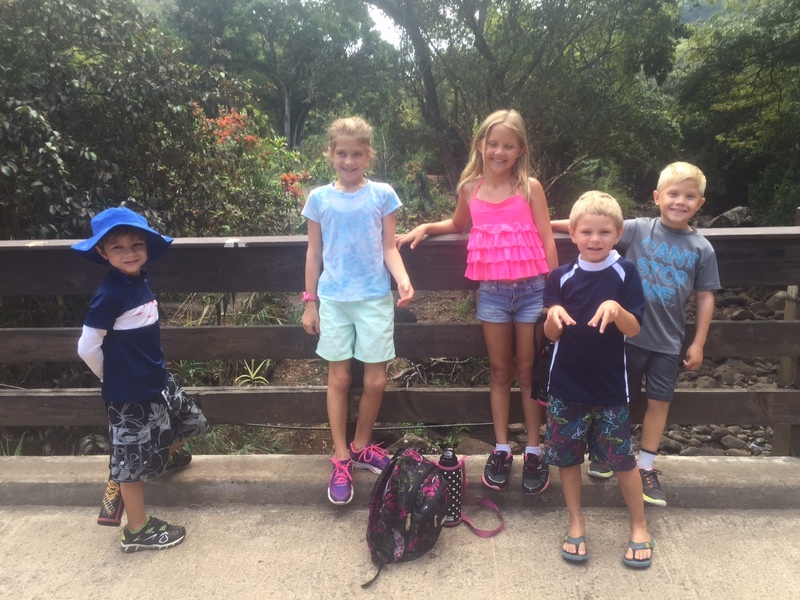 The author's children and their friends at Waimea Valley. Waimea Valley is always a hit with the kids! And that makes it the perfect venue for Fathers Day! Buffet is $39.95 for adults $15.95 for children 4-12 years old and starts at 11:30 am in Pikake Pavilion. FREE same-day Waimea Valley admission with each paid brunch. Click here for details. If your Dad deserves a rockin’ Fathers Day on Oahu, you have lots of options — but, not a lot of time. So, buy your tickets soon, so Dad can have the day he deserves!